It is important to consider every detail when it comes to establishing and enforcing your brand. The best firms recognize the importance of a well-placed logo or message. Where better to place it than at the top of a legal pad? 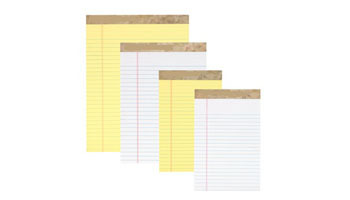 Customizing legal pads consists of imprinting the taped header portion with your logo, company name, and colors. What is the benefit of having custom legal pads? Custom legal pads are perfect for client meetings, conferences, new hires or as gifts to prospects and customers. 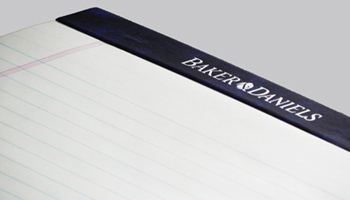 In a sea of look-a-likes, make your custom legal pad stand apart by modifying the head-strip. 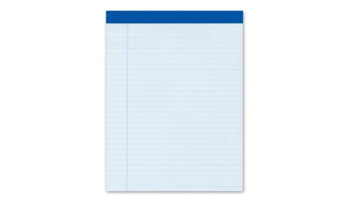 Our premium papers, available in white or canary, make for the smoothest writing surface in the industry. Your pen will glide effortlessly over the paper without tearing, snagging or bleeding through the other side. 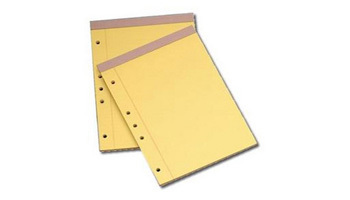 A machined perforation allows for clean and easy removal of sheets from the pad and our extra heavy-duty chipboard backing provides a sturdy, desk like surface for easy note taking. Corporate identity, a professional look and free advertising for your firm are just a few of the benefits realized from having custom legal pads.